Home > Fireplaces > Zero Clearance Fireplaces > Empire Breckenridge Deluxe Vent-Free Louvered Gas Firebox with Traditional Brick Ceramic Liner - 42"
This vent free firebox is fairly light and installs easy because no chimney construction is required. The hem-bent seams eliminate screws and fasteners that may work loose over time. The firebox comes with matte black hood and slat louvers as well as a traditional brick ceramic fiber liner. Most 30" vent free log sets will fit in this unit. The firebox's actual dimensions are 37 5/8" H x 43.5" W x 19 13/16" D and it requires framing dimensions of 38 1/8" H x 44" W x 19 3/8" D. The item carries a 5-year limited warranty. Can this Empire Breckenridge fireplace be installed in a corner? This certainly can be installed in a corner. The included owner's manual will have a dedicated section in regards to framing. One of the figures within that framing guide will cover the necessary framing dimensions to house the appliance in a corner. Does this Empire fireplace come with a blower? While this unit does not come with a blower, one is available for it under the "Popular Accessories" section of the unit's page. Can this product be used outdoors under a covered porch? We do not recommend this vent-free firebox for use outdoors, as it will eventually rust and corrode. What size logs can I use with this unit? 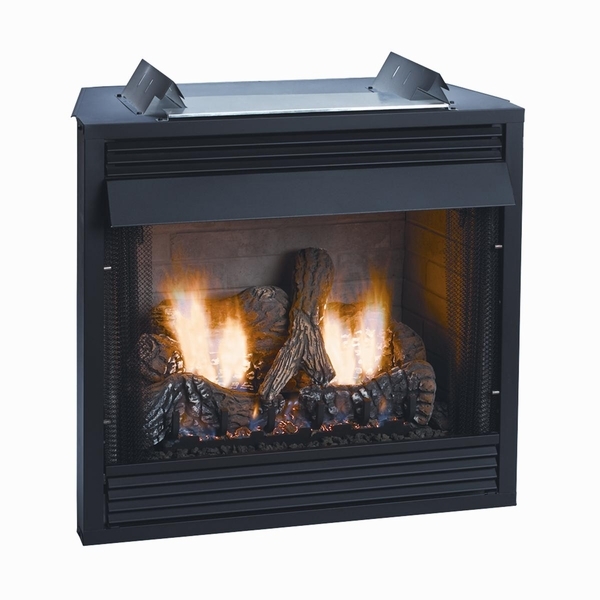 This vent-free firebox accepts most 30" ventless gas log sets.